1774-1834. He was born at Maypowder, Dorset on 28 November 1774, the elder son of Admiral Sir Richard King and of his wife, Susannah Margaret Coker. He was the brother-in-law of Admiral Sir Charles Rowley. King first went to sea in 1789 aboard the India-bound Crown 64, Captain James Cornwallis, flying the broad pennant of Commodore Hon. William Cornwallis, and he was promoted by the latter officer to the position of acting lieutenant, on 9 March 1791 with his commission date being 14 November. Remaining in the East Indies, he saw further employment aboard Cornwallis’ new pennant ship, the Minerva 38, in addition to the Perseverance 36, Captain James Smyth, and the Phoenix 36, Captain Sir Richard Strachan. On 20 September 1793, at the age of nineteen, he was promoted commander of the Bien Aimé 18 by Cornwallis, this vessel being predominantly manned by men from the flagship Minerva. After returning to England King was posted for purposes of rank only to the Excellent 74 on 14 May 1794, and in November he was appointed to the frigate Aurora 28, taking a convoy from Portsmouth to the Downs that month and serving in the Channel and off Ireland. A (very) miniature portrait of Admiral Sir Richard King, 2nd Baronet. Next joining the Druid 32 in August 1795, King returned to Spithead from Cadiz in early October and thereafter remained on patrol in the Channel and off the coast of France as well as taking a convoy out to Lisbon before returning to Portsmouth with the Oporto convoy in July 1796. Shortly afterwards Captain Edward Codrington assumed the acting command of the Druid. In May 1797 King commissioned the brand new Sirius 36 on the North Sea station, a vessel that had been constructed on the lines of the captured French frigate San Fiorenzo. One of his first duties was to sit on the court martial of the chief mutineer, Richard Parker, following the mutiny at the Nore in May. 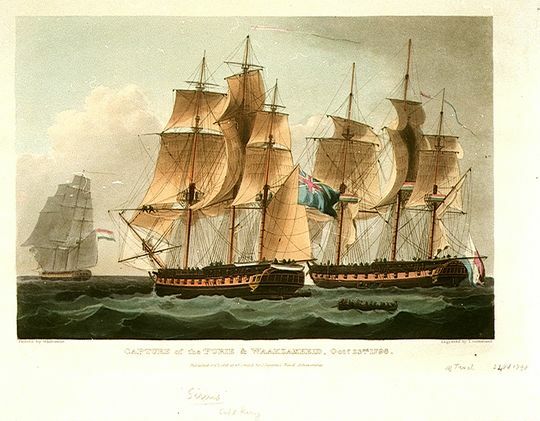 Returning to sea, he had the good fortune to fall in with a Dutch frigate and corvette off the Texel on 24 October 1798, capturing one of them the Waakzaamheid 24 with ease, and then reining in the other, the Furie 36, and taking her after a daylong chase. The fact that both frigates had been fitted out for transporting troops to Ireland did little to dull his achievement. In March 1800 King returned to Plymouth with intelligence of the Brest fleet, but he enjoyed little further excitement bar assisting Captain Samuel Hood Linzee of the Oiseau 36 in the destruction of the French frigate Dédaigneuse 36 on 27 January 1801 off the port of Ferrol. On the same day, with the assistance of the Amethyst 36, Captain John Cooke, he captured the Spanish letter of marque Charlotta 16. In July of that year Commander John Edwards arrived to act for him, and after the Sirius underwent a refit at Plymouth in the following spring King’s final service in the summer of 1802 was to lead a squadron containing a further frigate and three sloops in search of smugglers off the West Country. His frigate was paid off in August. In early 1804 King was appointed to the Veteran 64, commanding her in the Downs from February until June. After leaving her he remained unemployed until the end of March 1805 when he was given command of the Achille 74, which had undergone a major refit at Plymouth. Joining Vice-Admiral Cuthbert Collingwood off Cadiz, he commanded this vessel at the Battle of Trafalgar on 21 October where she was positioned seventh in the line in the windward column. Having silenced the already damaged Argonauta 80 in an hour-long duel, she captured the Berwick 74, her casualties of thirteen men killed and fifty-nine wounded bearing testimony to her active part in the engagement. In early 1806 the Achille underwent repair at Plymouth and in July she sailed to join the blockading squadron off Lorient and Rochefort. On 25 September she was with Commodore Sir Samuel Hood’s squadron when it captured four French frigates, although the Achille saw little of the action. On 27 November King succeeded to a baronetcy on the death of his father, and during 1808 he flew his broad pennant aboard the Achille in command of the Ferrol blockading force otherwise consisting of the Audacious 74, Captain Thomas Le Marchant Gosselin, and Theseus 74, Captain John Poo Beresford. The Achille thereafter was employed at the defence of Cadiz, and she continued in the Channel during 1809. Captain John Hayes held the temporary command of the Achille in the Schelde expedition from 28 July 1809 and returning to duty King was in command off Cherbourg until 1810, when his ship moved to the Cadiz station. From March 1811 he was captain of the fleet to Admiral Sir Charles Cotton, firstly in the Mediterranean aboard the San Josef 112, Captain George M’Kinley, and then in the Channel from May. He remained with the San Josef following Cotton’s death in February 1812 until he raised his broad pennant off Brest aboard the Bulwark 74, Captain Thomas Brown. Shortly afterwards, in March, a French squadron of half a dozen of the line from Lorient managed to bypass his blockade and enter Brest in heavy weather. On 12 August 1812 King was promoted rear-admiral, and with his flag in the Mulgrave 74, Captain Thomas Maling, he proceeded to the Mediterranean in April 1813 to become second-in-command to Vice-Admiral Sir Edward Pellew, transferring his flag to the Royal George 100, Captain William Cuming. Within a matter of days he moved his flag once more to the San Josef 110, Captain William Stewart, in which he was present at the fleet skirmish on 5 November. He later commanded the blockade of Toulon whilst Pellew was off Genoa, and it was under his orders that the fleet entered Hyères Bay under an armistice on 26 April 1814. In July, whilst in passage home, Captain Stewart died and Lieutenant Edward Barnard was promoted acting-commander of the San Josef. King was nominated a K.C.B. on 2 January 1815, but following Napoleon’s eventual downfall at the Battle of Waterloo he refused the command of the Mediterranean fleet for personal reasons. In the spring of 1816 he took passage aboard the Magicienne 36, Captain John Brett Purvis, to take up the position of commander-in-chief of the East Indies, pausing at Tenerife at the end of April before arriving at Trincomale in the late summer. Remaining in Ceylon through the winter, he shifted his flag to the Orlando 36, Captain John Clavell, in order to proceed to Bombay, and in October 1817 he moved into the newly-arrived Minden 74, commanded initially by Captain William Paterson, and in 1820 by Acting-Captain Thomas Cole. King eventually returned home in October 1820. On 19 July 1821 he was promoted vice-admiral and on 23 July 1833 was appointed commander-in-chief at the Nore with his flag in the Ocean 80, Captain Edward Barnard. In 1834 a cholera epidemic broke out on the Isles of Sheppey to which Admiral King succumbed after a two day illness at Admiralty House, Sheerness on 4 August. He was buried at All Saints Church, East Church, on the Isle of Sheppey. King was married twice, firstly on 29 November 1803 to Sarah Anne, the only daughter of Admiral Sir John Thomas Duckworth, who died aboard the Minden, his flagship in the East Indies, on 20 March 1819. He then married Maria Susanna, the second daughter of Admiral Sir Charles Cotton on 16 May 1822. He had issue four sons and a daughter from his first marriage, and four sons and three daughters from his second marriage. His second son from his first marriage, George St. Vincent Duckworth, served in the Russian war of 1855 as a captain and eventually rose to the rank of admiral. Three of his other sons entered the army, and one of his daughters married the nephew of Admiral Sir Willoughby Lake. King was patron to both the brother and son of Captain Digby Dent, who died commanding the Sceptre on 15 November 1798.